I'm growing fonder of my Haglofs Oz pullover. It's required a change of mindset, but as I get my head around its function I become more confident in it. It's amazingly light but has several drawbacks; it's a snug fit, doesn't seem as warm as a conventional jacket, it doesn't seem to cut the wind as well as a traditional hard shell, I'm sure Paclite isn't as breathable as other top-end fabrics and the Oz doesn't have the venting options to make up for it and last, but certainly not least, the hood peak is too sloppy. Some of these things may be perception rather than hard fact: do I really feel colder in the Oz than in a full-on hardshell or is that just my head playing tricks on me? Does the wind squeeze through the Oz to a greater degree than through heavier garments? Nevertheless, whether real or fantasy, most of these things can be dealt with by looking at the Oz from the right angle. Accept that the Oz has one function and one function only and the problems start to melt away. My Oz is pure and simply for keeping me dry when it rains. Nothing else. 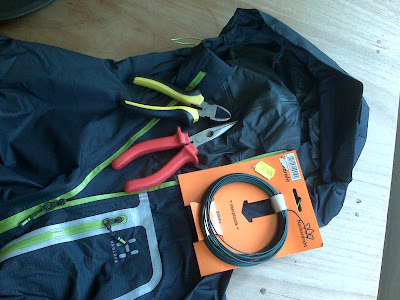 I have a wind shirt to cut the wind, I have fleece midlayers to keep me warm, I have merino baselayers which in combination with the aforementioned transport sweat away from my skin and send it on its way through breathable fleece and pertex. I have down held captive in dryshell to keep me warm when at rest. The wind shirt can deal adequately well with light rain and showers. Under most conditions therefore the Oz will be in my pack. And as weight is a primary concern for pack-dwellers the Oz is ideally suited for lounging around in my pack. The breathability issue is unfortunate, on those occasions when I have to don the Oz AND work hard things are probably going to get clammy but I think that's a fair price to pay. Time will tell. The one bug on the list that I can't live with however is the peak. Haglofs make great hoods. The hood on the Oz is one of them. It fits snugly, is easily adjusted (albeit needing two hands) and it turns with the head. That's, in my experience, just about everything a hood can be expected to do. I say, "just about" because the peak on the hood of the Oz falls well short of ideal. It's not stiffened and so collapses even in relatively light wind. As a result it doesn't protect the face from wind blown rain as it should. I expect that would be annoying for anybody but for wearers of glasses such as myself it's a real negative. I knew about this before I bought the Oz. PTC had made the point very clear and, furthermore, he'd done something about it. I've now followed suit with one of the easiest, and I think most worthwhile, gear mods I've ever carried out. Taking some polymer coated steel wire (of the wires available at my local D.I.Y. store the 1.4mm diameter seems to have about the right resistance for the job) I offered it up to the peak and cut it to length. A surprisingly long length of 60cm was required to follow the contour of the peak and fit snugly into the corners of the chin-guard where the left and right hand zippers terminate. I then doubled over the both ends of the wire to make a nice blunt radius and threaded it through the peak. 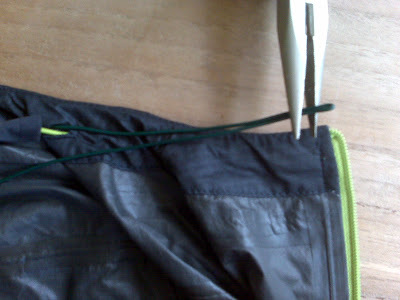 Haglofs has been realy kind to gear tinkerers since the exit hole for the hood elastic is on the underside of the peak, is big enough to accommodate the wire and is perfectly positioned for the job in hand. I fed the wire into the peak, encouraging it to sit as far forward as possible and kept going until the end was hard up against the zipper in the extreme corner of the chin-guard. I then repeated the task with the other end of the wire working in the opposite direction from the same hole. Sounds complicated? It's not! It's easier to do than to write down. I'm more than convinced by the finished job. The hood is now a fully-functional hood and appears to be the best hood on any of the jackets I own. Time will tell if I'm right about that. In any case I think it's a big improvement for almost zero effort and cost and the ddition of just 7g (my Oz now weighs 189g according to my kitchen scales). It was literally a five minute job and 10m of wire is yours for less than €4 (I now have plenty to spare!). I still have to decide if this is the right Shell for Norway in three weeks time but this mod brings me a step closer to making the call. Hoera! Eindelijk een Hyves waar u altijd met smart op heeft zitten wachten! 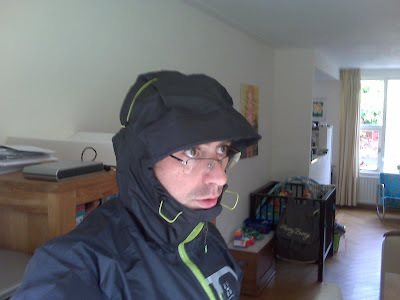 I'm looking forward to hearing how the Oz performs in Norway as I'm looking for a really light rain jacket and I've added the Oz and Ultimate to the list of possibles. By the way what size is your jacket? just curious regarding the likely weight of a size M.
I have the large but be warned it's a rather close cut garment intended primarily for high energy activities. I wonder on occasion if I shouldn't have gone a size bigger so I would've had the option of putting a more insulation under it. Also, its an expensive piece of gear to buy in the knowldege that you'll have to make a mod straight out of the box. It's easy enough to wire the hood but in my opinion it should be there already. I'm not sure which way this one will go. When I do, you'll read it here. Thanks Dave, good advice on the sizing. 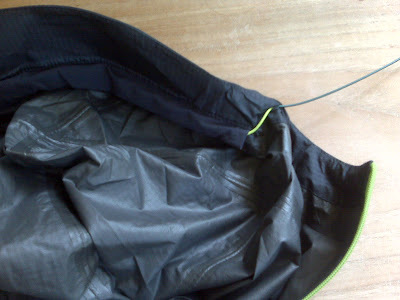 The hood below is Haglofs three-point adjustable, moves with your head even when only lightly adjusted and is very protective.